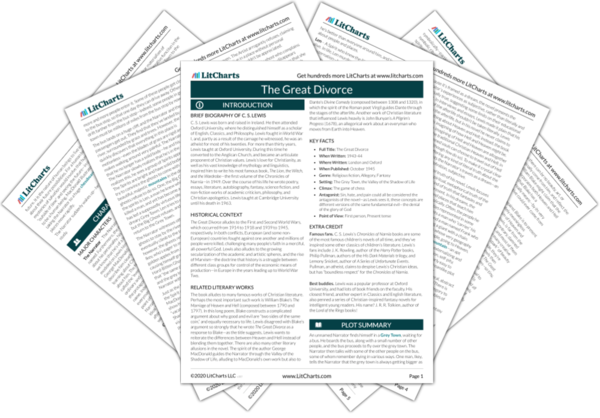 Instant downloads of all 942 LitChart PDFs (including The Great Divorce). 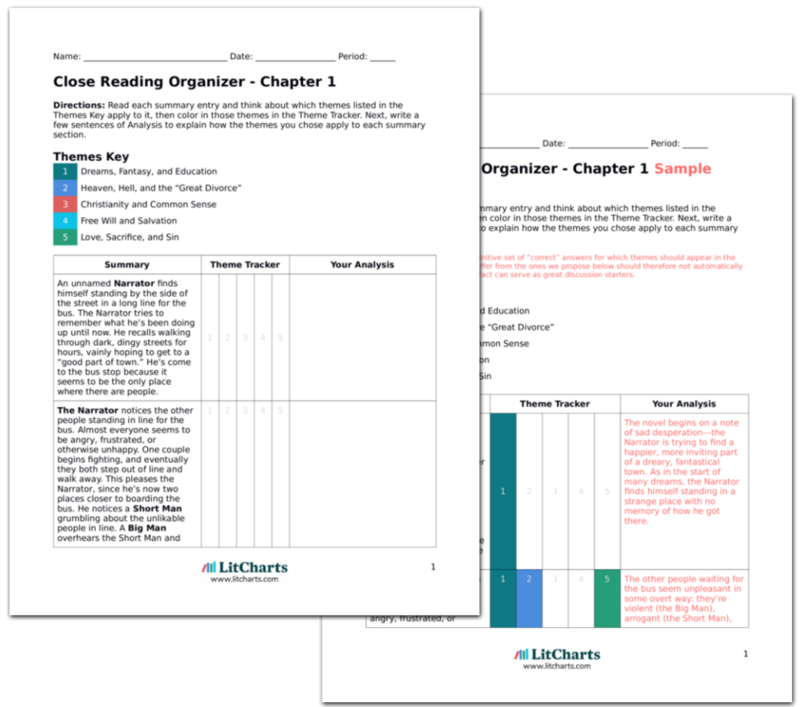 LitCharts assigns a color and icon to each theme in The Great Divorce, which you can use to track the themes throughout the work. The Narrator flees from the herd of unicorns. He then hears a low, Scottish voice, asking, “Where are ye going?” The Narrator turns and sees an enormous man with a long beard. The man is one of the Spirits—a “shining god” with an ageless soul. In reply, the Narrator says he doesn’t know. The man introduces himself as George MacDonald (in real life, a famous author). The Narrator is overjoyed to meet MacDonald, one of his favorite writers—he explains that MacDonald’s book Phantastes was an important formative influence on the Narrator, inspiring him to begin a “new life” in accordance with Christian practices. George MacDonald was a (relatively) famous 19th century writer, and, much like C. S. Lewis himself, both a talented fantasy author and a passionate defender of Christianity. MacDonald will act as the Narrator’s guide for the rest of the novel—an homage to Dante’s Divine Comedy, in which the poet Virgil guides Dante (who arguably sees himself as his protégé) through the afterlife. George MacDonald, addressing the Narrator as “Son,” thanks the Narrator for his enthusiasm and respect. He explains to the Narrator that “the damned have holidays.” Occasionally, the people of Hell are allowed to visit the river, although most opt to visit Earth instead. The Narrator asks MacDonald, “Is there really a way out of Hell into Heaven?” MacDonald replies that the people who live in the grey town are in Hell. But the people who manage to leave the grey town behind will have been in Purgatory, not Hell. The place in which the Narrator is currently standing is called the Valley of the Shadow of Life. And yet for those who choose to stay here, it will also be Heaven. The Narrator is very confused. MacDonald tries to explain the truth to the Narrator. Good and evil are “retrospective.” After a human being experiences good and evil, he can judge for himself whether his experiences were good or evil. A human being who lives a just life on Earth and goes to Heaven would say that his life on Earth was Heaven. Similarly, a human being who leads an evil life and goes to Hell would say that life on Earth was Hell. In this way, a place can be Heaven to some and Hell to others. The Narrator, trying to understand MacDonald, asks if it’s true that Heaven and Hell are only states of mind. MacDonald explains that Hell is a state of mind—indeed, any selfish state of mind is a form of Hell. But Heaven, on the other hand, is a literal, real place—indeed, Heaven is reality itself. Here, MacDonald (essentially expressing Lewis’s own ideas about Christianity) argues that Heaven is “reality itself.” This is a surprising idea, but one that fits with Lewis’s overarching argument that Christianity is the “common-sense” way to think about life, love, and goodness. This passage emphasizes the novel’s argument that all sects and denominations of Christianity are fundamentally the same, in spite of some superficial differences between them. Put another way, the passage suggests that Lewis’s “model” of Heaven, Hell, and Purgatory isn’t supposed to be literally true—rather, it’s just a way for him to illustrate universal Christian concepts. 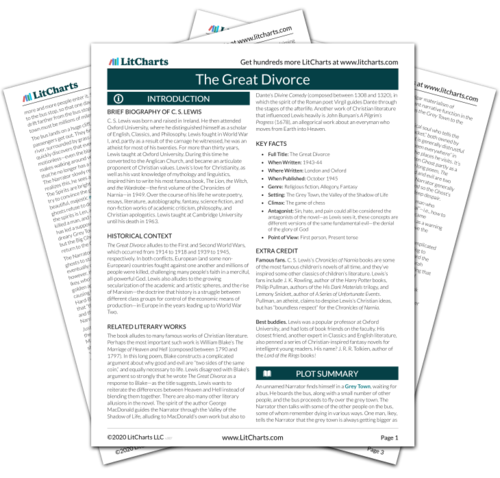 Get the entire Great Divorce LitChart as a printable PDF. The Narrator asks MacDonald about the role of choice in the afterlife. The souls who leave the Valley of the Shadow of Life and go back to the grey town have made a choice—but what choice, exactly, have they made? MacDonald replies by quoting the poet John Milton: “Better to reign in Hell than serve in Heaven.” All the souls who choose to be in Hell agree with Milton. They’re like spoiled children who’d rather sulk than apologize. MacDonald argues that damnation is a state of mind, not an external action. In other words, damned souls have chosen to be damned by turning their backs on God. For the remainder of the novel, MacDonald will show how sinners deny themselves true happiness by choosing to pursue money, power, and other illusory pleasures (i.e., “to reign in Hell”). Lewis condenses his arguments about Heaven and Hell with a quote from John Milton, whose long poem Paradise Lost was an important influence on Lewis (and the history of Christian thought in general). The Narrator asks MacDonald about vice and sensual sin. MacDonald explains that some people go to Hell because they practiced sin during their lives. Human beings who “live for pleasure” start out as happy, loving human beings. But at some point in their lives, the humans who live for pleasure stop craving pleasure, and begin to crave the “itch” of pleasure instead. Eventually, these people turn their backs on pleasure and begin to embrace pain and hatred instead—a sin for which they go to Hell. In this passage, MacDonald makes the surprising argument that “sinful pleasure” isn’t truly pleasurable at all—all true pleasures come from God. Therefore, sinners have deluded themselves into thinking that they’re getting pleasure from sin—even though once they turn away from innocent pleasure or true happiness, they’re just simulating the feeling of pleasure (the “itch,” as MacDonald puts it). MacDonald remembers a man named Sir Archibald. During his life, Archibald was a diligent researcher who wanted to understand “survival.” He studied philosophy and psychology and lectured all over the world. He craved knowledge above everything else. But when he died, he came to the Valley of the Shadow of Life. Archibald became dissatisfied. There was no more research to be done, since everybody had “survived” already. Archibald cared about research more than he cared about happiness, so that, in the end, he chose to go to Hell instead of continuing on to Heaven. There are many others like Archibald—people who were so interested in proving the existence of God that they forgot to love God. Similarly, there are many people who were so invested in spreading Christian doctrine that they forgot to worship Christ. Sir Archibald’s life symbolizes the dangers of the “life of the mind.” Archibald loved to learn about the world—as a result, he became deeply dissatisfied after he died, since in Heaven, everyone is presumably equally knowledgeable and fulfilled. Thus, the danger of living an intellectual life is that one might become more interested in the pursuit of knowledge than in knowledge itself. Knowledge (and, by the same logic, evangelism and worship) is a means to an end—a way of understanding the world, and therefore, God. Much like sinners who mistake the “itch” of pursuing pleasure over pleasure itself, intellectuals like Archibald come to prefer the pursuit of knowledge to the pleasure of knowledge—and therefore, the pleasure of divine salvation. The Narrator asks MacDonald why the Spirits don’t go down to Hell to rescue the damned. MacDonald explains that the Narrator will understand soon enough, but points out that the Spirits have sacrificed their own journeys into the mountains in order to help people move out of Hell and journey to the mountains. He also claims that all the people in Hell who truly want to go to the mountains will go there eventually, even if it takes a very long time. The Narrator’s question reflects some of the Hard-Bitten Ghost’s positions about divinity. If God is all-powerful, he’s essentially asking, why doesn’t he send Spirits to “liberate” the damned from Hell? MacDonald’s reply to the Narrator underscores the importance of free will: damned souls themselves must choose to go to Heaven. MacDonald and the Narrator turn to see a ghost talking to one of the solid Spirits. The ghost is complaining about a woman, talking so quickly that the Spirit can’t get a word in edgewise. She also complains about having died before her time. The ghost and the Spirit move away, their voices fading into the distance. Alone again, the Narrator asks MacDonald about the ghost who just passed by. He suggests that such a ghost—a “silly garrulous woman”—isn’t a sinner at all; she’s just an annoying “grumbler.” MacDonald says that the question is whether “there is a real woman still there inside the grumbling.” If there is, then the woman will go to Heaven. The state of being in Hell, MacDonald goes on, always begins with complaining. Most human beings complain a lot; sometimes, they “repent” and stop complaining, but sometimes they just continue complaining, until they’ve forgotten what it means to be happy. MacDonald argues that complaining can be dangerous, because it trains people to enjoy their own unhappiness. MacDonald’s argument emphasizes the idea that damnation begins with the corruption of true pleasure—even in a form as innocuous-seeming as complaining. It’s also worth noting that, for the second time in the novel, Lewis presents a female character in arguably stereotypical terms—as a bickering, gossipy busybody. While many of the male characters in the novel are also stereotypical (since all the ghosts are basically allegorical figures for different sins), critics have argued that the novel’s male characters are more psychologically nuanced and three-dimensional than their female counterparts. MacDonald invites the Narrator go for a walk—the Narrator grabs MacDonald’s arm, and MacDonald carries him around the woods. The Narrator lists many of the ghosts that he and MacDonald see. The first is a female ghost. The ghost talks to many different Spirits, and is always trying to contort her body. Gradually, the Narrator realizes that the ghost is trying to make herself look attractive to the Spirits. But this is impossible—just as it would be impossible to make a corpse look attractive. Eventually, the female ghost gives up, turns back to the bus, and returns to Hell. The female ghost is so focused on her superficial appearance that she allows her soul to remain damned. Like so many of the inhabitants of the grey town, the female ghost is deeply confused about what matters in life: she values her body (even when she no longer has a body at all) more than her soul. The Narrator tells MacDonald about the herd of unicorns who frightened away the ghost earlier. MacDonald explains that the Spirit who summoned the unicorns was trying to scare the ghost into running toward Heaven. While fear itself cannot make a ghost turn toward Heaven, fear can sometimes force a ghost to “forget itself” for a moment, allowing the ghost to entertain new ideas about Heaven. Sometimes this technique works. Here MacDonald suggests that “forgetting one’s self,” even because of pure fear or surprise, has the potential to cause people to look outside their narrow worldviews and consider God. MacDonald brings the Narrator to a group of ghosts who have gotten close to Heaven only in order to tell the people of Heaven about Hell. Some of the ghosts were teachers in life (just like the Narrator), and they try to lecture the people of Heaven. They act as if the people of Heaven are weak and sheltered, since they’d never experienced true pain. The ghosts act as if their experiences in Hell give them greater maturity and experience, but they find that none of the people in Heaven take them seriously. Sometimes, sinners and atheists behave as if they’re smarter and worldlier than Christians. But the passage suggests that this idea is absurd: sin is fundamentally irrational, meaning that, if anything, sinners are more naïve and unintelligent than the virtuous. The Narrator discovers that many of the ghosts he meets with MacDonald have tried to “bring Hell to Heaven.” Some of the ghosts have tried to convince the people of Heaven to rebel and seize Heaven for themselves. The Narrator also meets some ghosts who claim that there is no afterlife—their current situation is just a hallucination. Other ghosts enjoy visiting Earth and scaring the living. Sometimes, the sinners try to “infect” the virtuous with their own sinfulness—essentially trying to cause others pain because they are in pain themselves. The passage also reiterates the idea that sinners are fundamentally irrational: they’ve deluded themselves into denying the obvious truth that Heaven is preferable to Hell. The Narrator also meets ghosts who scarcely look like human beings anymore. Some of these ghosts have traveled for thousands of years just to visit the Valley of the Shadow of Life and criticize it. Surprisingly, MacDonald tells the Narrator that some of these ghosts eventually enter Heaven, while there are many gentler ghosts who never enter Heaven. Apparently, it’s better to go to the Valley to criticize it than to not go at all. On a symbolic level, this suggests that people willing to at least engage seriously with issues of God and morality (for example, walking for thousands of years!) are more “truthful” in their lives than those who never do anything too horrible, but also never question the status quo. MacDonald brings the Narrator to a ghost whom the Narrator recognizes—in life, the ghost was a very famous artist. The Artist is talking to a Spirit—he’s dismayed to learn that in Heaven, he won’t be allowed to paint anything. The Spirit explains to the ghost that in life, he became famous because he was capable of seeing glimpses of Heaven in Earth. There will no longer be any point in painting these “glimpses” in Heaven, since the real Heaven will be more beautiful. The Artist continues to ask the Spirit about painting in Heaven. He claims that he likes painting more than he likes looking at real objects. The Spirit reminds the Artist that this wasn’t always true—as a young man, the Artist only began painting because he loved to look at the visual world. The Artist insists that he no longer cares about light and vision; he paints for the sake of painting. The Artist, much like Sir Archibald, has become more interested in the means than the ends: in other words, he’s become so obsessed with the struggle to depict beauty (and therefore Heaven) that he’s forgotten about the pleasure of Heaven itself; he’s replaced true happiness with a supposed quest for happiness. The passage could represent Lewis’s critique of modern, abstract art, or at least of “art for art’s sake” (another good example of means supplanting ends). The Spirit tells the Artist that in Heaven, there is no ownership or intellectual property—everything that belongs to one person belongs to others. The Artist replies, “That’ll be grand” unenthusiastically. He asks if he’ll be able to meet the other great painters of history, and the Spirit replies that he’s unsure. Everyone in Heaven is “famous”—famous to the “only Mind” that matters. Another reason why the Artist dislikes the concept of Heaven is that he’s obsessed with property—even though, in reality, the world is God’s property, and nobody else’s. The Artist also dislikes that everyone in Heaven is equal—clearly, he thinks of himself as an especially important person, and therefore resents the idea that in Heaven he’d be equal to the other saved souls. The Artist mutters that he’ll have to be satisfied with his legacy on Earth, since such a legacy won’t be respected in Heaven. The Spirit laughs and tells the Artist the truth: on Earth, the Artist is already forgotten—other schools of art have triumphed, leaving the Artist’s work highly unfashionable. Furious, the Artist turns back to bus, shouting about how he has to compose a manifesto. The passage suggests that creative people often place too much stake on earthly fame—even though earthly fame is largely out of their own control. The Artist ends up seeming pretty ridiculous: he struggles for fame, yet ends up being almost completely forgotten. Much like Ikey, he is so used to striving for earthly rewards (the recognition of his peers, e.g.) that he continues to do so long after they’ve ceased to matter. Arn, Jackson. "The Great Divorce Chapter 9." LitCharts. LitCharts LLC, 5 Dec 2016. Web. 18 Apr 2019. Arn, Jackson. "The Great Divorce Chapter 9." LitCharts LLC, December 5, 2016. Retrieved April 18, 2019. https://www.litcharts.com/lit/the-great-divorce/chapter-9.